Humanity and inhumanity, an existential paradox that reveals itself within the formation of each being and is reflected in every interaction and link created throughout their life between themselves and every different, delicate and outnumbered “other”. Instead of discovering and accepting the other, we tend to ignore even the existence of another. The inhumane, contemporary man is frantic about every socially inclusive approach in the formation of our societies, glamorizing many urban and architectural images pushing towards a standard, mechanical, hypnotized and artificial city. What makes the inhumane humane, the uninhabitable inhabitable, and the city a space that reflects directly the image of the human creating it, is the adaptation of a universal design. As defined by the Cambridge Dictionary: “the quality or characteristic of something that makes it possible to approach, enter, or use it”, accessibility, in the big urban scale or the smaller architectural scale, follows the scenario of universal design perfectly. In other terms, accessibility is the result of a human-centered approach that respects the needs and lifestyle of every individual, especially a disabled individual’s need to move safely and freely around many spaces. It follows the organic system of a building, a neighborhood or a city, erasing the inhumane social insulating layers that refuse all that is different, and placing the human scale as the center of the city. 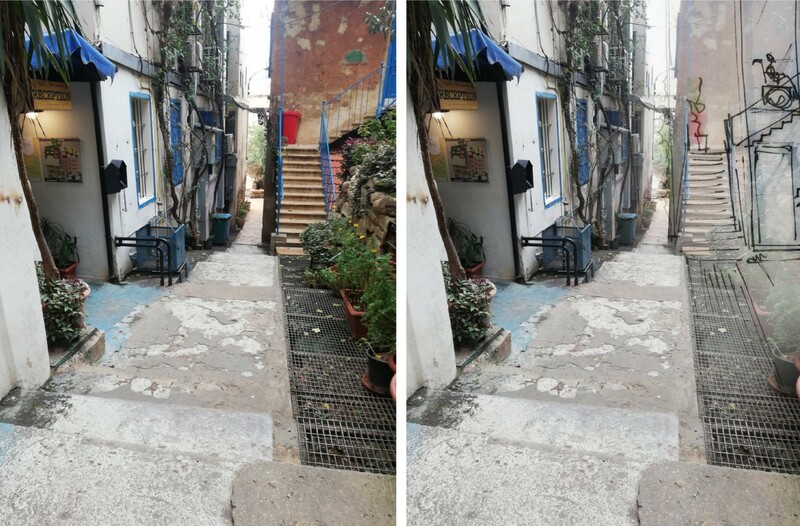 In our modern world, the socially-responsible human, architect or designer, who is aware of the urban amnesia, stopped placing the concept of accessibility as an afterthought to the design process and started adopting it as a crucial part that helps improve the quality of the project, making it more innovative and inclusive. Nevertheless, accessibility is still a foreign concept to a lot of people and is still considered in many cases an additional requirement for designers. A dream space might be what each and every one of us designers aspire to create. But will everyone have the equal opportunity to access it and enjoy what it has to offer? Being taken for granted today in many parts of the world, accessibility is still questioned in Lebanon. As a typical citizen living in Lebanon, one constantly fears that walking around may land him in a hospital. In cities dominated by cars and crippled sidewalks, it seems almost impossible for Lebanese to use pedestrian accessibility. Therefore, it does not come as a surprise that the majority of people with disabilities in the country feel excluded from the rest of the public. Even though rules and regulations exist, such as plans for urban rehabilitation and initiatives for disabled inclusion in society, yet implementation is little. In May 2000, the Lebanese parliament adopted the Law 220 on the Rights of Disabled Persons (Law 220/ 2000) which ensures the basic rights for the disabled. This law clearly states that citizens with disabilities have the right to be included in social and economic life. They must have rights to employment, transportation and housing, as well as health care and education (Lakkis, El-Sibai, & Thomas, 2015). The country’s building laws, therefore, must compliment the Law 220 by demanding that “all public buildings, installations, facilities and means of transportation should implement the technical regulations that facilitate disabled people’s access to them” (LCDP, 2005). Figure 1: Boulevard Mall, Saida, Lebanon. The first image shows the proposed ramps at the entrance for handicap accessibility. The second image shows built, the state without ramps. However, this is not the case; due to minimum compliance and lack of control by the concerned authorities, accessibility continues to be a major issue for the disabled. An inspection conducted by the National Association for the Rights of Disabled People in Lebanon for more than 612 public and governmental buildings as well as private facilities shows that most of these buildings did not abide by the laws for disabled accessibility (LCDP, 2005). Later in 2011, the government issued the decree 7194/15 to include minimum requirements for accessibility in public buildings such as parking spaces, accessible entrances, availability of wheelchair ramps, and adequate elevators and toilets, most of which are still ignored (Cauli, 2014). Figure 2: Jeanne D’Arc Model Proposal. As far as the cityscape is concerned, sidewalks and roads are poorly equipped to facilitate disabled accessibility and hardly any public transportation is able to accommodate a passenger with special needs. Even though various projects have been proposed to local municipalities, little work has been done. 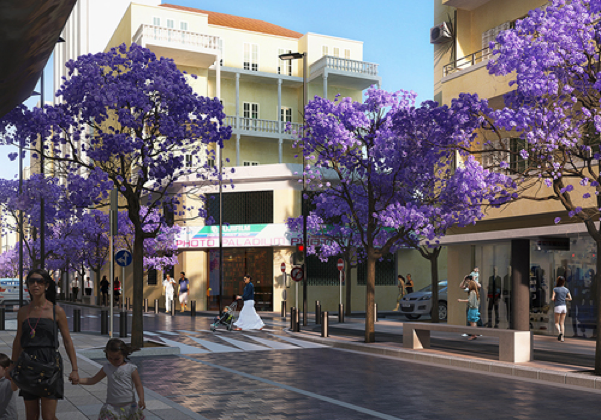 A good example of such projects is the Jeanne d’Arc Street model, which aimed at becoming an example for accessible and pedestrian-friendly streets in the city. 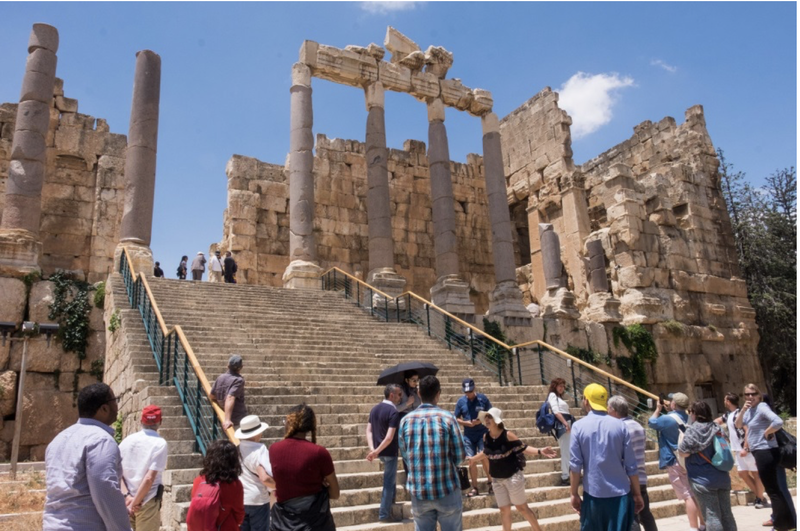 Figure 3: Tourists visiting the Ruins in Baalbeck, Lebanon. 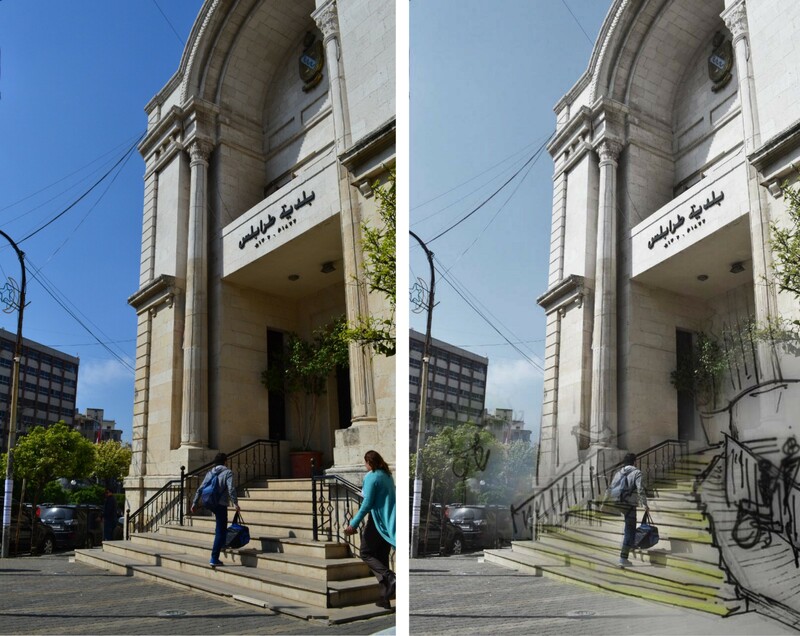 While tourism continues to be of great importance to the local economy, tourists consider Lebanon to be very inaccessible for travelers with disabilities. According to Lonely Planet, “Lebanon is a challenging place to travel for those with disabilities. Pavements are uneven and often in disrepair, while public transport has no wheelchair access. At the time of research, there was no wheelchair-friendly taxi company in Beirut. Few hotels and very few restaurants and bars have accessible toilets” (LonelyPlanet, 2017). Therefore, it is the responsibility of local municipalities to work towards creating an inclusive tourist experience for all. Figure 4: Protest for People with Special Needs, Beirut, Lebanon. Statistics state that 10 to 15% of the Lebanese overall population are disabled, not to forget the elderly, pregnant women and people with temporary physical injuries in some cases. Knowing that a huge number of people were disabled during the Lebanese Civil War (1975–1990), the post-war city we live in today is barely accessible for them, and the reconstruction of some areas in Lebanon did not focus much on adapting these people in the community. Lebanese legislations state that 3% of total employees in any institute should be people with disabilities. These people don’t feel safe to go alone anywhere because most of the streets and buildings lack basic facilities, including accessibility in the workplace as well. This problem may be summarized by these main issues people with disabilities face: elevators sometimes smaller than a wheelchair, no braille signs included with important signs, directions or elevator buttons, and a lack of handicapped toilets in many public facilities. One of the suggested solutions by Youssef, a handicapped university student, was simply for architects and urban planners to ensure making wider spaces, such as wider sidewalks, so that they can move easier among other pedestrians. Along the already narrow sidewalks, one also finds motorcycles and cars parked above them, lots of hurdles (columns, trees installed in the wrong way) and shops that extend to fully take the space. That’s also what Mr. Ismail, a visually-impaired man, suggested because although he is above 50 years old, he cannot go further than his neighborhood alone. This is due to narrow sidewalks and dangerous street crossings that are not designed for the visually-impaired to use them. Can you imagine that around 15% of our population cannot go around by themselves or do not feel safe to do so? Most of the people with disabilities need someone to take them from one place to another all the time which is another main obstacle. Unfortunately, the disabled community in Lebanon continues to face humiliation and discrimination. The government and authorities wish not to comply and carry on ignoring these basic human demands. 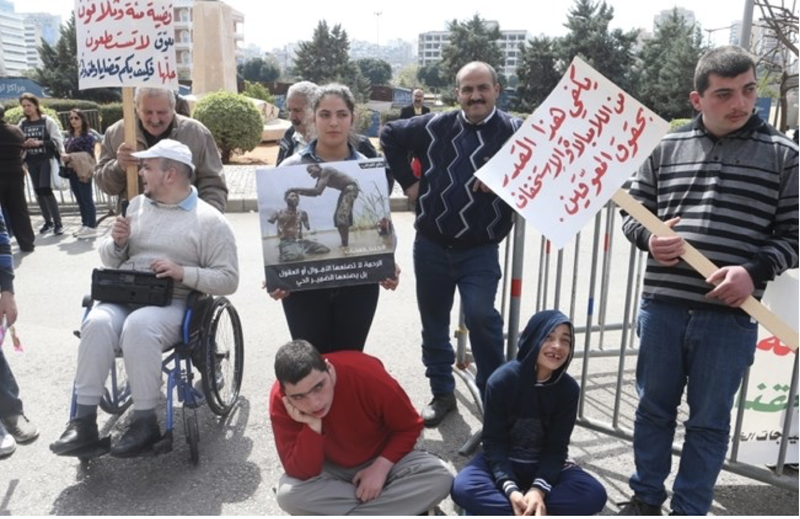 While efforts for change have not been met, organizations such as the Lebanese Physical Handicapped Union (LPHU) and the Lebanese Council for Disabled People (LCDP) are constantly thriving to protect the rights of people with disability through protests and awareness campaigns. One of which is the “Build for All” Campaign that aims at removing environmental barriers for handicapped accessibility. It is rare that topics such as accessibility get discussed openly in Lebanon, even though many articles are found about the topic, it is not enough. In addition to that, pressure should be applied on authorities to push for editing the building code in a way that compels architects to include accessible spaces for people with special needs. However, real change has to start with this generation of designers and architects, starting with faculties instructors motivating their students to keep in mind the circulation of people with special needs in their design projects throughout the design process. Coming up with innovative solutions that allow all people to move from one level to another safely will only enrich the student’s project and speak volumes about the maturity of the kind of designers who will hopefully make future Lebanese cities more and more inclusive. 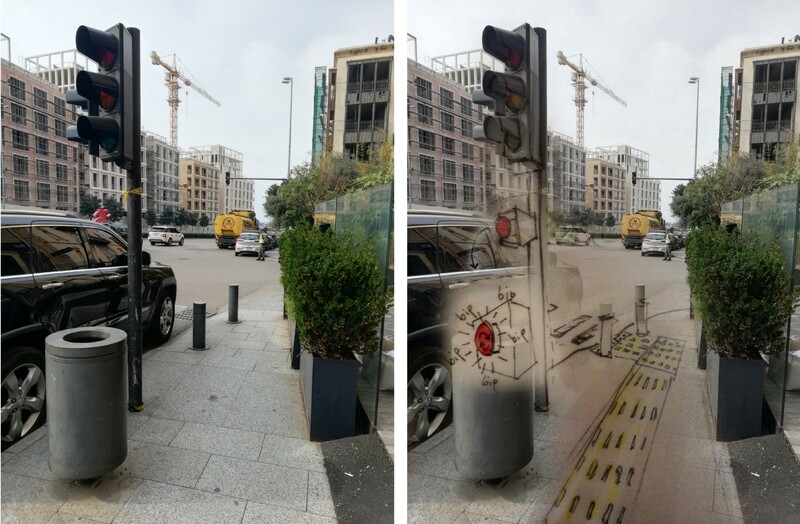 A traffic intersection in downtown Beirut with a traffic light equipped with a button that moves and beeps to signal for the visually impaired pedestrian to pass, along with textured pavements. An old residential building in Gemmayze “Saifi Institute” with an elevator that allows a wheelchair user to access it. This article has been written by Architects for Change Members: Gilbert Helou, Nour Zreika, Yara Ayoub, and Ghina Kanawati. Simulations and Editing done by Architects for Change Members: Rasha Kleib and Stephanie Srour. Figure 1: Boulevard Mall, Saida, Lebanon. First image showing proposed ramps at the entrance for handicap accessibility. Second image showing built state without ramps. Author: Self. Lakkis, S., El-Sibai, N., & Thomas, E. (2015). Lebanon: Disability and Access to Information. London : ARTICLE 19. LCDP. (2005). Disability Report in Lebanon: Where do we stand regarding the application of Law 220/2000, and admitting the rights of the disabled people in Lebanon? Al- Raida, 31–35. Architects for Change is a youth-led organization, founded in 2014 and based in Beirut.